From a mediation perspective, the national dialogue process that brought Tunisia to this point is noteworthy for at least two reasons. First, the mediators in this case were insiders with a stake in the outcome. Second, changes in context, beyond the control of either party, significantly altered the strategic calculations of the negotiators and opened the window to an agreement. On 23 October 2011, Tunisians elected a National Constituent Assembly in the country’s first democratic elections since the January 2011 overthrow of President Zine El Abadine Ben Ali. From these elections, the Islamist movement Ennahda emerged as the largest party and formed a coalition government with two smaller and non-Islamist center-left parties to oversee the transitional period and the process of drafting a new constitution. In response, an opposition bloc formed under the leadership of Nidaa Tounes (Call for Tunisia), a secularist party which was strongly opposed to the government, and to Ennahda in particular. In April 2013, under political pressure following the assassination of the Leftist political leader Chokri Belaid, Ennahda agreed to give up control of three key government portfolios (the ministries of interior, defense, and foreign affairs) and to appoint politically “neutral” technocrats to run them. Nonetheless, tensions continued to rise and, following the assassination of Mohamed Brahmi – another Leftist political figure – on 25 July, Tunisia descended into a full-blown political crisis. Protestors took to the street and the opposition began calling for the government’s resignation and the dissolution of the National Constituent Assembly. In a bid to defuse the crisis and seek consensus on a number of controversial questions President Moncif Merzuki called for a national dialogue. The Quartet did not conform to the classical model of a neutral external mediator. The UGTT has a long history of playing a role in Tunisian politics, and was itself involved in leading street protests and a general strike in the wake of Brahmi’s assassination in July. Some members of the Quartet were also known to be close to the opposition and, as representatives of different sections of Tunisian society, all Quartet members had a stake in the outcome of the dialogue. For these reasons, Ennahda’s leaders were skeptical that the process could lead to a fair outcome. Initial tentative discussions between the parties and the Quartet therefore focused largely on the Quartet’s own interests in mediating. Only once the Quartet had explicitly acknowledged its own interests could it build trust and the discussions move forward. Ultimately, the process would not have succeeded without Ennahda’s engagement and commitment to a positive outcome. What, then, prompted Ennahda to engage, despite its initial skepticism? The answer is that two unforeseeable external events, beyond the control of the political players in Tunisia, ‘changed the game’ for Ennahda: the assassination of Brahmi on 25 July and the coup d’etat earlier that month which removed the Muslim Brotherhood from power in Egypt. These events prompted an internal process of reflection and debate within the party that resulted in the leadership’s decision to become an active participant in the Quartet-facilitated dialogue and to make its success a priority. 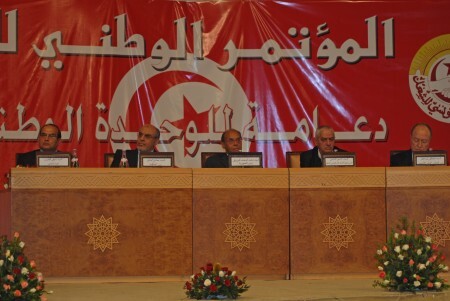 The party leadership realized that, in the face of significant opposition from within the state and from social elites (including the bureaucracy, the business community, the media, the security services, the universities, and important opinion-makers), relying on the party’s electoral mandate would not be sufficient to avoid the risk of the Egyptian crisis being duplicated in Tunisia. Some have cast Ennahda’s decision to opt for consensus and compromise as a defeat for Tunisia’s largest party, suggesting that it was forced to yield to political and popular pressure. Others interpret it as a conscious, laudable decision to put the national interest and the democratic transition before party politics. Still others see it as a pragmatic calculation concerning the party’s long-term interests. Similarly, there are doubtless also many diverse narratives about the motivations behind the Quartet’s role in mediating the crisis. Regardless of your analysis, for mediators the case is a reminder of two valuable points. First, understanding the wider context in which the mediation is taking place is essential – as events external to the process will inevitably have repercussions for the process itself. Second, a neutral mediator is not a precondition for a successful mediation. Ultimately, it is the acceptance of the parties concerned, rather than neutrality, that matters. Now that the Tunisian constitution has been approved by a large majority, and a new technocratic government is in place, the stage is set for elections before the end of the year. Although it is unlikely that everything will be ‘plain-sailing’ from here forward, Tunisia’s national dialogue provides a welcome example of how, given the right context, a genuine commitment to solving differences through negotiation and mediation makes solutions possible. Owen Frazer is a program officer in the Mediation Support Team at the Center for Security Studies (CSS). This post is inspired by presentations and discussions at a recent meeting of analysts working on political conflicts in the Middle East and North Africa.